SportMaster contractors install Pickleball court surfaces and perform construction using the same methods as utilized on tennis courts. When building a Pickleball court, is equally important to secure an experienced contractor with knowledge of tennis court and sports construction. This will ensure that you get proper construction, slope, and drainage for your Pickleball court. Once the asphalt or concrete slab is in place and properly cured, it is time to choose an acrylic SportMaster Pickleball court surfacing system. The SportMaster ColorPlus system offers the largest array of Pickleball surface colors, with 16 standard colors in which to choose. The Color Concentrate and Ready-Mix Color will also provide the same surface results for Pickleball, with 9 standard colors. The standard surfacing mix on each of our color systems is ideal for Pickleball, or the surface texture can be customized to meet your specific needs. Ask a SportMaster representative or installer for more information, if your are interested in customizing surface textures on your Pickleball court. The SportMaster© ColorPlus™ System is Revolutionizing Pickleball Court Surfaces. How the System Works: The ColorPlus™ System consists of a 100% acrylic Neutral Concentrate™ (available with or without sand) and the ColorPlus™ Pigment Dispersion. What is truly unique about the ColorPlus™ System is the fact that only 2 gallons of ColorPlus™ Pigment are needed to colorize an entire 30 gallon keg of Neutral Concentrate™. Ease of Mixing: ColorPlus™ is a highly concentrated pigment dispersion that disperses readily into the Neutral Concentrate™ pickleball court surface coating. Our proprietary technology enables ColorPlus™ to disperse completely with minimal mixing. Exceptional Quality: The ultra-fine particle size of the ColorPlus™ Pigment Dispersion produces vibrant, consistent color quality on pickleball court surfaces. Greater Inventory Control: By stocking a single base product, contractors are able to optimize warehouse storage space and reduce shipping costs. The ColorPlus™ System takes much of the guesswork out of ordering pickleball court surfaces. Contractors simply maintain a minimal level of ColorPlus™ Pigment in one gallon buckets. SportMaster Color Concentrate (or Color Concentrate with sand) is also available as an alternative to the ColorPlus system. Color Concentrate has already been pigmented so only the addition of sand and water is required prior to application. SportMaster Ready-Mix Color is also a good choice for Pickleball court surfacing. Ready-Mix Color comes in 5-gallon pails and is ready-to-use, after some mixing. Both of these Pickleball color coating systems are offered in 9 standard colors. The ProCushion System, depicted in the illustration above, is the ultimate professional and residential cushioned option for pickleball court surfaces. This 100% acrylic coating system is designed to provide optimum resilience and joint-friendly play. The shock absorbing layers of the ProCushion system provide unparalleled player comfort at an affordable cost. Flexible acrylic binders maintain the cushion feel of the rubber granules for many years after application. 2 to 3 coats of CushionMaster™ Neutral Base with ColorPlus™ Pigment Dispersion. Each layer in these systems serve a specific purpose, and contribute to the quality of the finished court. 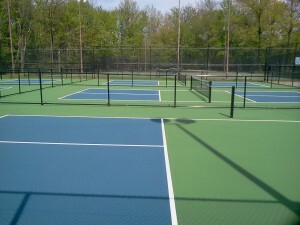 Multiple acrylic pickleball court surfaces form the firm, uniform and durable wearing surface. CushionMaster is an upgrade of additional rubberized coats that provides dynamic response to body impact, attenuates foot and leg shock, and reduces body fatigue. Acrylic Resurfacer is the base coat that fills voids in the pavement and adds texture for the cushion granules to “grab” onto during application. SportMaster pickleball court surfaces can be installed indoors or outdoors, on asphalt or concrete. Additional SportMaster products are used for patching, leveling and crack sealing. SportMaster pickleball court surfaces can be used for a variety of sports other than pickleball. Other racquet sports like Tennis, Badminton and variations like Paddle Tennis and Paddleball are commonly played on acrylic surfaces. Multi-court applications with blended, or different color, lines for each sport can easily be installed to provide a variety of game options on the same court. A premium 100% acrylic emulsion designed for maximum performance and weather resistance. Neutral Concentrate™ can also be used as an acrylic resurfacer filler coat. Sand needs to be added on site. A sand filled, non-pigmented coating for pickleball court surfaces. Mix with ColorPlus pigment and water before application. Contains specific grade of sand, premixed for consistent texture on pickleball court surfaces. A highly concentrated pigment dispersion designed to disperse readily and completely in un-tinted pickleball court surfaces (Neutral Concentrate & Neutral Concentrate with sand). Available in 16 standard colors. Ideal for maintenance crews and do-it-yourselfers. The proper sand and water is already added. Simply stir, pour, and apply by soft rubber squeegee to achieve vibrant pickleball court paint in 9 standard colors. 100% acrylic emulsion coating designed for on-site mixing with silica sand and water. Ideal surface for pickleball courts, tennis courts, and other pavement surfaces. Available in 9 standard colors. Similar to our standard Concentrate but with sand already added. Color Concentrate with sand takes the guesswork out of choosing the right type of sand for consistent play on pickleball court surfaces. Easy to use, just add water and apply by soft rubber squeegee. Available in 9 standard colors. A unique acrylic color formulation engineered to match the flexibility in the cushion layers of the CushionMaster system. These pickleball court surfaces maintain their flexibility over time. CushionMaster Neutral Base is designed to be mixed with ColorPlus Pigment Dispersion. Acrylic emulsion that provides resilience and establishes the base texture to impart the pace of the pickleball court surfaces. Contains fine rubber particles and fills voids and levels the final cushion components. Acrylic emulsion that provides resilience and establishes the build and thickness of cushioned pickleball court surfaces. Contains coarse rubber particles for use on the initial coats. 100% Acrylic resurfacer is designed to smooth and level pavement prior to application of pickleball court surfaces. Can be used for a coating or patching material. Available in Black and Neutral. 100% Acrylic resurfacer is designed to smooth and level pavement prior to colored pickleball court surfacing layers. Can be used for a coating or patching material. Sand is already mixed eliminating the need to mix on site. Available in Black and Neutral. 100% Acrylic liquid binder designed for on-site mixing with sand and cement. Ideal for leveling and repairing low spots and depressions up to 1/2 inch deep. Apply prior to Acrylic Resurfacer and pickleball court surfaces. Premium grade heavy-bodied 100% acrylic elastomeric crack filler. Remains flexible at temperatures below zero. Available in red, green or neutral colors to blend in with existing pickleball court surfaces. 100% Acrylic trowel grade crack filler. Fortified with sand for filling cracks up to 1 inch wide. Available in red, green, blue, or neutral. Neutral can be tinted with ColorPlus or colored pickleball court surfaces to match court without resurfacing. 100% Acrylic elastomeric crack sealant designed for filling cracks up to 1/2 inch wide. Flexible down to -10 ºF. Available in red, green or neutral. CourtFlex is also tintable with pickleball court surfaces and ColorPlus for ease of maintenance. 100% Acrylic water based line paint highly pigmented for one coat coverage. For striping pickleball court and other sports surfaces. 100% Acrylic water based textured line paint highly pigmented for one coat coverage on pickleball court and other atletic surfaces. For Sharp Lines! 100% Acrylic clear drying emulsion primer that is applied prior to T/C line paint to fill the minor voids between the masking tape and the pickleball court surface. Assures crisp, razor-sharp lines. Clear drying 100% acrylic top coat for pickleball court surfaces, tennis courts, and more. Extends the life of color coatings. Ready-to-use. 100% Acrylic emulsion primer designed to promote the adhesion of repair products and pickleball court surfaces. Apply by spray, roller, or brush. Ready-to-use.